"Fastest single computer" marks new breakthrough for Nvidia. 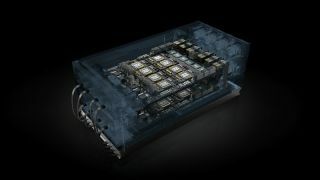 Nvidia has unleashed a major upgrade to its high-performance computing and artificial intelligence (AI) capacities with its most powerful hardware yet. According to Nvidia, the HGX-2 provides flexibility to support the future of computing. It allows high-precision calculations using FP64 and FP32 for scientific computing and simulations, while also enabling FP16 and Int8 for AI training and inference. This architecture will help run applications for scientific purposes, like weather forecasting. Also, it will be capable of training and running AI and deep learning instances, which can be used for things like image or speech recognition. Four server makers — Lenovo, QCT, Supermicro and Wiwynn — announced plans to bring their own HGX-2-based systems to market later this year. Foxconn, Inventec, Quanta and Wistron are designing HGX-2-based systems, also expected later this year.